Leading Manufacturer of ubs 3200 beam saw and ubs 3200 auto beam saw from Ahmedabad. 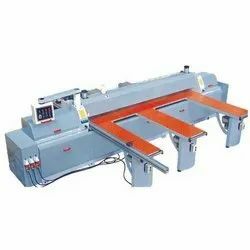 We are the most acknowledged Manufacturer of UBS 3200 Beam Saw in india.This machines are essentially developed to cut oversized objects at suitable rates. It contains a solid body along with ultimate 400mm long saw blade with excellent quality guide track for high productivity. The length of Workbench is 3200 mm; also there are multiple panels for exceptional cutting of work piece. Especially we have provided a highly developed Dust precipitating system in this machine to prevent the functioning background from saw dust.Pneumatic clamping system is given to hold an object for accurate working & uniform productivity. Here in this device we have endow with a PLC System for effortless using & controlling. Pneumatic clamping for ensuring both ends clamping. Material feed return speed 60 m/min. Material feed speed 50 m/min. We are the leading and prominent Manufacturer, Exporter and Wholesaler of UBS 3200 Auto Beam Saw . 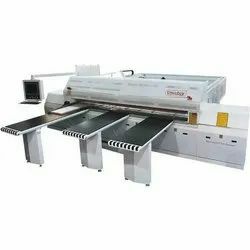 Maximum Production Output With Excellent Cutting Of Multiple Panels. Servo driver in feeding, and the set the position with high precision immediately. And with high speed feeding. The height of main saw blade can be adjust automatically, according the thickness of workpiece. You can adjust the sub-saw blade in touch screen, without any tools by hand. This machine can reduce the cutting time, according the workpiece's width is 1000 mm, then the saw only travel 1000 mm. There is a rectify a deviation device.it can push the workpiece to the fence backer automatically. so that it can cut with high precision in right angle. The correcting roller adopts double rollers, it can choise the right width of workpiece automatically to correct the cutting position. And the robot hand, it can protect the surface of board by the adjustable holding power. It also can work grouped. Servo motor, guide line and rack can supply the high speed moving of saw unit. It can set accurate cutting time by servo driver.Also can detect cutting length automatically.